The Thunder Bay local of Labourers' International Union of North America (LiUNA) hopes to be offering mobile apprenticeship training as soon as summer 2019, thanks in part to a federal government grant. A Thunder Bay union local hopes to take apprenticeship training on the road as soon as summer 2019, thanks in part to a federal government grant. On Wednesday, the Canadian government announced $181,000 in funding for the Labourers' International Union of North America (LiUNA) Local 607's mobile training classroom. The mobile classroom will accommodate up to 16 students, and offer construction craft worker and concrete finisher training. It's currently under construction, and union officials hope it will be ready by this summer, said Terry Varga, the business manager for Local 607. "We can also do skills and safety training, as well," Varga said at Wednesday's announcement, which was made at the Local 607 hall in Thunder Bay, Ontario. Varga said the classroom will travel wherever there is a demand for it, such as job sites and remote communities. "It's hard for members, or workers, or apprentices ... to always come to Thunder Bay, because of the distance," he said, noting that "our apprenticeship classes run for seven weeks." "It's going to be a lot more convenient ... to bring the training to the people, instead of the people coming here." The union is contributing about $90,000 to the classroom. 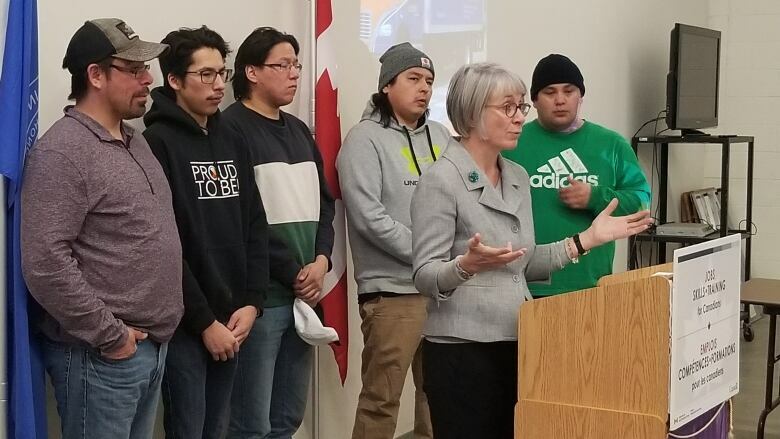 Federal Minister of Employment, Workplace Development and Labour Patty Hajdu, who made the funding announcement, said the classroom will help attract new people to the skilled trades sector. "Travelling is one of the biggest barriers ... for people considering a career in the trades," Hajdu said. "This is an exciting announcement for LiUNA, who needs new members, and for the region." Hajdu said while unions and government employment programs may offer subsidizes to those seeking training in the trades, there are still many expenses that need to be covered, including accommodations, travel, tuition and food. It's an issue her ministry is working on, she said. "I actually think that if we can crack the apprenticeship nut, we actually have 65,000 skilled trades jobs that we can fill," Hajdu said. "We have to work on making sure that people understand that these skilled trades jobs are not just well-paying, but they're incredibly professional, they're very technical." "So, it's really two-fold: how do we decrease the stigma of the skilled trades, and how do we increase the capacity for people to take part in the training that's available."